Advanced Ceramics is high quality cosmetic laboratory specializing in Smile Design, full mouth reconstruction, implants as well as everyday crown and bridge cases. We offer state-of-the-art technologies, including the Cerec In-Lab 4.0 cad cam system, IPS E-Max cad, Empress Esthetic and E-Max press for Pressable Ceramics as well as full contour ht monolithic zirkonia (Brux-Zir) to provide natural beauty, consistency and unsurpassed strength. 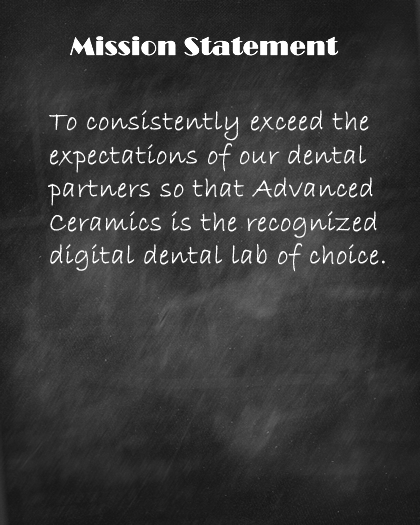 We encourage digital impressions: simply select Advanced Ceramics as your favorite lab before exporting the file with Cerec Connect. We maintain a close professional relationship with all the doctors we serve. We strongly believe that continuing education is the key to successfully providing the professional service that our clients have grown accustomed to. Keeping abreast of developments in materials, technology and protocols enable us to produce work with the highest degree of consistency and punctuality. What is more, we proudly buy and produce only in the USA. Behind every great dentist there is a great lab. We know you have a choice and we thank you for choosing us! In order to serve your office well, we request a short conversation regarding your preferences to accommodate your particular needs and style. Copyright © 2016 Advanced Ceramics. All Rights Reserved.